We are proud to have been of service to you, our customers, for almost 80 years. The people at SFS realize that it is you, the customer, that has been the key to our success. We will continue to strive to earn your business.Write, fax, or call us today. We look forward to visiting with you soon. We would like to extend to you an invitation to visit our office and warehouse facilities in St. Louis. What is a FORTUNA Splitter? 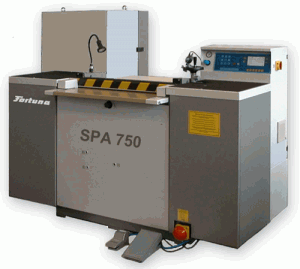 The FORTUNA splitter is a precision splitting machine used by the rubber, plastics, and leather industries. It is used in laboratories and production operations to research and develop new materials, run quality tests and inspections, or to investigate complaints. The high-precision separation of the FORTUNA splitter makes it ideal for testing with scientific accuracy and reproducing results. A rubber splitting machine is used in laboratories to separate out material layers to precise thicknesses in order to study their compositions. Precision splitting, such as the type that a rubber splitting machine is capable of can produce a material thickness of approximately 0.1 mm. This allows companies to determine material compositions, reproduce results, and create new materials. Some of the products analyzed by the splitting machine are water hoses, gaskets and profiles, high pressures hoses, and neoprene layers. Read more about this process on our FORTUNA page. The FORTUNA leather splitter is a splitting machine, or a bandknife splitter, used in the leather industry to prepare materials before production. 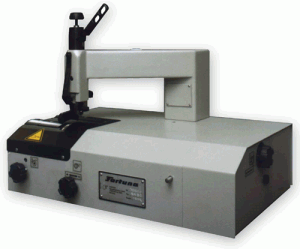 SFS Associates has been selling leather splitter machines for almost 80 years. We sell many versions of the bandknife splitter, which you can see on our leather splitter products page. Among these are the AB 320, AN 400, and NAF 470 models to name a few. If you have any questions about the FORTUNA leather splitter or another FORTUNA splitter, please give us a call at (314) 531-1830. We’d be happy to answer any questions you have. What is a Skiving Machine? A skiving machine will shave or reduce the edges of materials before they are put together. This process is useful in the leather goods industry. A leather skiver is used to shave the edges of products such as moccasins, handbags, and shoes to make it easier to stitch them together. The skiving machine can be set to whatever thickness you need to get the job done. These machines are also used for preparation of other materials such as plastic, rubber, cardboard, and felt. 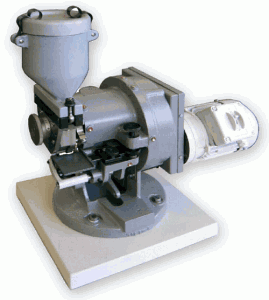 SFS Associates also sells leather skiver machines which can be used in a wide variety of applications. Our 34-S-AG FORTUNA skiver is ideal for moccasins. The 50 KK-S is used primarily for insoles, cardboard, and felt. While the 50KT-P is ideal for use in the fur industry. There are many different leather skiver and other skiving machines. To find your perfect FORTUNA skiver, check out our skiving machine products page, or give us a call at (314) 531-1830.